The estate of Duntreath lies on both sides of the Blane Valley some twelve miles to the north of the city of Glasgow. Today, in the 1990s, it comprises some 6000 acres. "The Parish of Strathblane" by Mr. John Guthrie Smith, (published in 1886) remains an authoritative work. He states that "The original Barony of Duntreath" consisted of Duntreath, including Craigbrock. 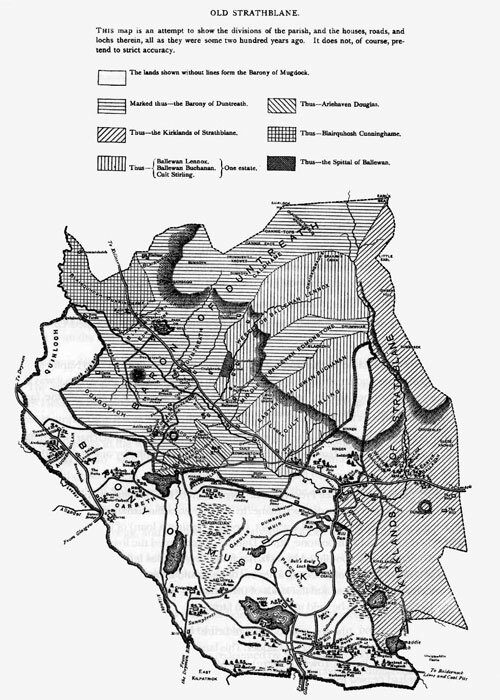 Arlehaven Edmonstone, including Auchentail, Dumgoiach (Dumgoyach) Blairgar, including Blairgarmore, Blairgar Begg, and Caldhame; Ballewan Edmonstone, or Middle Ballewan; and Cult Edmonstone, including Corriedale." Arlehaven. The eastern part of this, known as Harlehaven Douglas, belonged from 13th century to the Douglasses of Mains. In 1665 John Douglas of Mains granted a charter of Harlehaven to John Lyle, whose descendant, James Lyle, sold the eastern part to John Norwall (or Norval), "Weaver of Arlehaven" in 1782. Four years later, in 1786, Lyle sold the western part, called West Arlehaven, or Meadowhead, to Sir Archibald Edmonstone, 1st Bt. Consequently, in 1868, Sir Archibald Edmonstone, 3rd Bt., bought East Arlehaven from the Norwalls, descendants of the weaver. Ballewan. Mid Ballewan, or Meikle Ballewan, as it was once called, has remained largely unchanged. The Spittal of Ballewan, a small acreage of land on the western side (now know as the High Haggles Field), is believed to have been granted by one of the Earls of Lennox to the Knights Templars. After their suppression it was held by the Knights Hospitallers, from whom it passed into secular hands. It first appears in the writs of Duntreath when a charter of alienation of The Temples Lands of the Hospital of Ballewan" was given by John Blair and others to James Edmonstone of Broich. James Edmonstone then sold them in 1696 to his nephew Archibald Edmonstone of Ballewan. The Archibald Edmonstone lairds of Spittal continued until 1833, when the then Archibald sold them to his distant cousin Archibald Edmonstone, 3rd Bt., of Duntreath (see p.29). Blairgar, Blairgarbegg, and Caldhame. Blairgarrbeg includes the hill of Dumgoyne. Calhame, now a part of the Lettre sheep farm, stretches in a north-easterly direction to the top of the Earl's Seat, (traditionally the look out point of the Earls of Lennox) which, at 1896 feet, is the highest point on Duntreath. The of Dumfoyne stands upon its eastern march. The Cult, which became known as Cult Edmonstone, was included in the grant by the Duchess of Albany to Sir William Edmonstone, 2nd of Duntreath, in 1445. Sold to a family called Foyer in 1716, it was redeemed by Sir Charles Edmonstone, 2nd Bt., in 1820, sold again to the Foyers, and finally bought back from them by Sir Archibald Edmonstone, 3rd Bt., in 1825. Corriedale,or Corrieacre. This was probably detached from the then adjoining farm of Cult Craigbarnet so that hay could be brought down from the hills which belonged to the Edmonstones to the north. Dumgoyach. This also was included in the charter of the Duchess of Albany to William Edmonstone, 2nd of Duntreath in 1445. The land was at one time divided into small farms together with a mill and mill lands. Two little farms called Capponhill and Shenanend lay to the east of the hill but the whole was converted into one farm during the nineteenth century. Blairquhosh Edmonstone, included Roseyards, is an old holding of the Edmonstones, but not a part of the original Barony. Prior to 1394 it is known to have belonged to Adam Spittal who in that year sold it to his cousin Walter, laird of Buchanan. On 18th November 1488 Sir Archibald Edmonstone of Duntreath obtained the lands of Blairquhosh on the resignation of David Gilchriston, alias Dow of Blairquhosh, for security of £46. Subsequently, in 1493, it was divided into three parts. The deed narrates "That the said Archibald Edmonstone and his heirs for ever shall have that east third part near the lands of Duntreath beginning from the burn of Croftelan, descending to the Water of the Blane by the ridge where the oak grows." This oak, known as "The Meikle Tree", which stood by the roadside at Blairquhosh, was a favourite trysting place both for peaceful purposes and for the assembling of the Strathblane branch of the Clan Buchanan in times of war. It survived as a local landmark until the 1960's when, because it was dying and dangerous, it had to be cut down. The other two thirds of Blairquhosh were somehow acquired by a family called Cunninghame before 1535. "Blairquhosh Cunninghame" as the land was called, became the property of Lord Napier in 1638. It afterwards belonged to the Buchanans of Carbeth, with whom it remained until 1857 when it was bought by Sir Archibald Edmonstone, 3rd Bt., from John Buchanan of Carbeth. It comprises the farms of Blairquhosh Cunninghame, Burnfoot, and Drummickeich. The Lettre consists of the Temple lands of the Lettre, and the lands called Machar, which, like the Spittal of Ballewan, are believed to have been granted to the Knights Templar by one of the early Earls of Lennox. In 1461 the Commendator of the Preceptory at Torphichen of the Hospital of St. John in Jerusalem gave a charter of the lands to Thomas de Buchanane. In 1614 Thomas Buchanan of Carbeth sold them to Sir William Livingston of Kilsyth, who had a wadset, (security against a loan) of the estate of Duntreath. Then in 1630, when Sir Archibald Edmonstone, 7th of Duntreath, redeemed the loan the lands of the Lettre were included. The matter was completed by a charter from King Charles I, dated 28th June 1632, upon the resignation of William Livingston, erecting in favour of Archibald Edmonstone, the parts of the Barony of Duntreath which were redeemed and the lands of the Lettre (sic) into a free Barony for ever, as in the charter of King James II, 1452, to be held in free blench farm. Previous to this, in 1599, the "ten pound lands of Lettre" had been bought by Archibald's father, William, 7th of Duntreath, from the Stirlings of Cadder. This land then became the farms of the Westerton, Easterton, Baptiston (or Baptist Town of Lettre) and Middletown. By the beginning of this century however, Middleton had ceased to be a farm and the house was rebuilt and enlarged by Sir Archibald Edmonstone, 5th Bt., for his sister Lady Dunedin. Map taken from "The Parish of Strathblane" by John Guthrie Smith F.S.A. Scot. 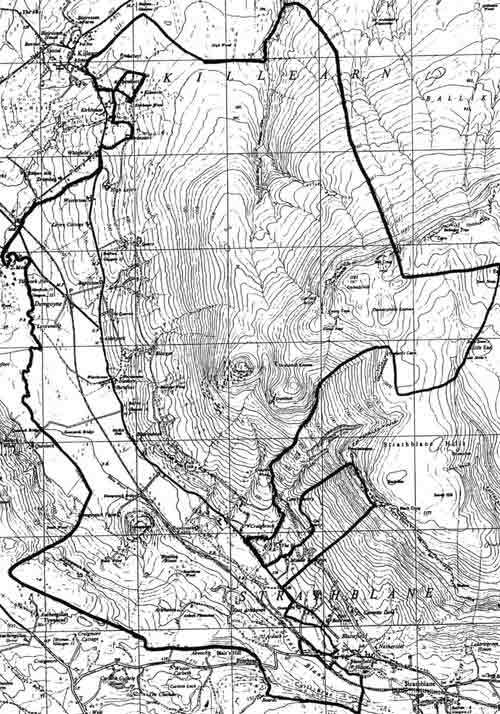 Map showing the extent of Duntreath Estate. In 1956, on the inheritance of the present laird, his mother Gwendolyn, the dowager Lady Edmonstone, moved into the "Lettre Cottage", as it then was called, where she lived until she died in 1989. Now, to avoid confusion with the former gardener's cottage which lies immediately to its rear, it has become the "Lettre House". The Ibert, which according to the authors of "The Parish of Killearn" means "The Sacred Place", lies on the western perimeter of the estate. The same source tells us that William Graham, son of the 2nd Earl of Montrose, who became a Canon of Glasgow Cathedral and Rector of Killearn in 1549, had a charter from his father for the lands of Killearn, Ibert and Drumbeg dated 1560. His descendants, the Grahams of Killearn, were Lairds until 1752. The Ibert was then acquired by the Buchanans of Carbeth who sold it to Sir William Edmonstone c.1883. The hill of the Ibert was then included in the Lettre sheep farm while the lower ground until recently, carried a herd of dairy cows. The Ibert House is now the home of Philippa, Sir Archibald's eldest daughter, and her children Louise and Tom. Duntreath Castle itself stands in the floor of the Blane Valley at a height of about 100 feet above sea-level. It was sited originally as a fortress in a place that was easy to defend. The conical wooded hill of Dumgoyach (composed of basalt volcanic rock which survived the erosion of the ice age) stands to the south west. On the opposite side of the valley, the summit of Park Hill has been artificially levelled. Upon these heights at one time sentries must have kept watch and marksmen been posted to mow down approaching foes. Also the Park, due west of the castle, was once so prone to flooding that horses were likely to be bogged. Now thanks to extensive draining by the present laird and his father, this ground is sound enough to be used for equestrian events, but once it proved a deterrent to enemies aimed upon attack. During the time of its existence Duntreath estate has changed in many ways. Houses have been built, woods planted and felled. The Glasgow water supply from Loch Katrine to Mugdock reservoir, was opened by Queen Victoria in 1859, and "The Water Track", built to facilitate the maintainance of the underground pipes, runs along the eastern side of the Blane Valley. Closely watched by the Home Guard during the last world war, it is now much used by walkers as a link between Blanefield and Killearn. The stretch of railway line, built by the Blane Valley Company between Lennoxtown and Killearn, was opened in 1867. Subsequently it was extended to Aberfoyle but was closed in 1951. Part of it now lies within "The West Highland Way", along which thousands of people walk each year. Basically however the land is the same. The names on the first charters, are almost identical, only the spelling altered. Duntreath amongst them remains.